HS Umformtechnik puts an end to wear – with our newly developed highly wear-resistant double-skin pipe bends! In pneumatic conveying systems, conveying abrasive products – in particular at high conveying speeds – leads to abrasion and thus to wear in the pipe bends. 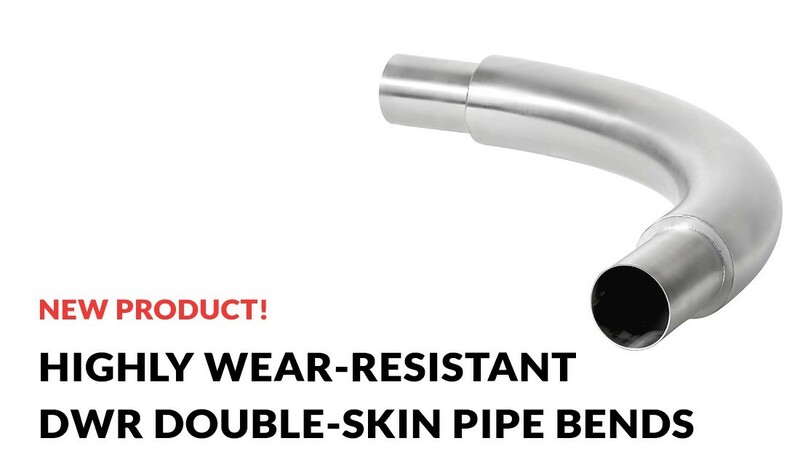 In order to prevent this, the pipe bend of our highly wear-resistant DWR double-skin stainless pipe bends is encased in a second pipe bend, which creates a double-walled chamber. This acts, so to speak, as a “protective shield”: After the wear has taken place on the internal pipe bend, it fills with the product to be conveyed. When this process is completed, you are then conveying „product on product“ – and no further wear is possible! In this variant, the classic “double skin” comes into effect. After the wear has taken place on the internal pipe bend, you are conveying “product on product”. In this variant, the double skin is lined with concrete, which reduces the signs of wear even further. Our DWR double-skin pipe bends for abrasive materials are available in many standard diameters and radii – feel free to contact us for further information or have a look at our DWR product flyer! Welcome to the news section of HS Umformtechnik GmbH! In this news blog we we would like to keep you informed about our company, our products as well as industry news. We would be delighted to welcome you here on a regular basis.